• In February Jim Caviezel made his sixth pilgrimage to Medjugorje and afterwards travelled to Vienna where he gave an interview to Christian Stelzer for the magazine Oase des Friedens. The Croatian translation is published in the latest edition of the Medjugorje parish magazine Glasnik mira. • Jim, can you tell us how did you hear about Medjugorje? My wife came to Medjugorje while I was in Ireland, shooting the movie Monte Cristo. Things were not that great although I worked seven days a week. One day she called me, and I could notice in her voice that there was a change. She started talking about Medjugorje, and how one of visionaries was about to come to Ireland. I interrupted her by saying: “Listen, I really have some serious stuff to do. I am not able now to go into anything with any of the visionaries.” Besides that, I thought that as Catholic I do not have to necessarily accept Lourdes or Fatima or Medjugorje. That is how I thought. I remember that in the catholic school I attended earlier in my life, once we heard about Medjugorje we were thrilled, but we found out soon that the local bishop was objecting and considered the apparitions to be false, and so we lost our interest immediately. The visionary Ivan Dragicevic came to Ireland and I knew straightaway that I would not have time for him, since I had to work all the time. One day my movie partner Jim Harris wasn’t feeling well, so I got the day off and I was able to attend an apparition. I stood at the very back of the packed church and I wasn’t quite sure about what was going on. But when the man next to me in his wheelchair fell down on his knees at the time of apparition I was deeply moved. I thought: this handicapped man, despite all of his pains, is kneeling down on cold stone floor and he is praying! Today I realise it was only God who knew me so well that He knew where exactly He needed to touch me to get my attention! Although it might sound strange, on the following Sunday I got another day off and I was able to meet with Ivan, which was my wife’s special wish. During the time of apparition I knelt close to him and I said in my heart: “Ok, here I am. I am ready. Do with me what you want.” In the same moment I felt as something was fulfilling me. It was very simple, and yet unique. When I got up, tears were running down my cheeks and I started to cry with all of my heart. Ivan told me: “Jim, man always finds time for what he loves. If somebody who doesn’t have any time finds a girlfriend and falls in love with her, he will always find time for her. People don’t have time for God because they do not love Him.” And he continued: “God is inviting you to pray with the heart.” I asked him: “How am I supposed to do that?” “By starting to pray”, he replied. In that moment the doors of my heart were opened. I couldn’t even dream about that being possible. We went to restaurant, and I must admit that the wine and food I had was never as tasteful as on that particular night. In the warm light of love that I felt within me, I was able to realise where I really was, how many temptations I had, where were my feelings, how weak I was and how strictly I judged other people. After filming was completed, and that was in Malta, I decided to come to Medjugorje. When I was 20, an inner voice would say to me that I should become an actor. When I spoke about that with my father, he used to say: “If God wants something of you it is for you to become a priest. Why would He want you to become an actor?” I did not understand either at that time. Again, I asked myself the same question, does God want me to become an actor, to make lots of money and to become rich? I was aware of the imbalance in the world between those who have a lot and those who barely have enough for survival, and I knew that is not what God wanted, and was I to make a choice to seek wealth that does not provide permanent happiness, or to serve God who wants to guide my life? At that time, Medjugorje reminded me of Bethlehem and I thought, just as Jesus was born in a small place, in the same way the Mother of God is appearing in a poor village in between hills. Those four days I spent in Medjugorje at that time were my turning point. In the very beginning I was still amazed at how much people prayed in Medjugorje. Everything reminded me of basketball camp. There you do not play just one match a day, but continually. The same as in school where you do not read just once a day, but always, repeatedly. In those first days in Medjugorje I felt inner unrest while I was praying, because I was not used to praying that much, and I was asking God to help me. After four days the only thing I wanted to do was to pray. Whenever I prayed I felt connected with God. That was my experience I would wish for every Catholic! Maybe as a child, I felt something similar and I forgot about it. Now it was given to me again. The same experience continued back at home. In our family we live the sacraments together. As we drive the kids to school we pray the Rosary together. Sometimes when I don’t start to pray my son starts first. When I came to Medjugorje for second time, I expected to have those first, initial experiences again but it was different. After lunch one day, some pilgrims invited me to go with them to visit Fr Jozo Zovko in Siroki Brijeg. That was also my wife’s desire. I didn’t know Fr Jozo personally, but I was very much impressed by all stories I heard about him. I met with him. He laid his hands on my shoulders. I laid mine on his shoulders. He laid his hands on my head. I laid mine on his head. In that moment I felt the words within me: “I love you, my brother. This man loves God.” Fr. Jozo spontaneously turned towards his interpreter and asked her who I was and said that he wanted to talk to me. That was beginning of a lasting friendship. That was the time immediately after we finished shooting the “Passion”, and at that time I was able to experience all conflicting forces within me regarding that movie. • Can you tell us why felt that way, and what was the connection between that movie and Medjugorje? You are probably familiar with expression “to cross the rubicon”. That means it is not possible to go back, you reach the point of no return. The “Passion” was such a rubicon for me. When shooting started, I was 33 years old, just like Jesus. I always wondered if I was even worthy to play Jesus. Ivan Dragicevic encouraged me and said that God does not always necessarily choose the best, which is something he sees in his own situation. If it wasn’t for Medjugorje I wouldn’t have ever agreed to take that part because it was in Medjugorje that my heart opened to prayer and to the sacraments. If I wanted to play Jesus I knew I needed to be very close to him. Every day I went to confession and I attended Eucharistic Adoration. Mel Gibson was coming to Holy Mass as well with the condition that Holy Mass was in Latin. That was good because in that way I learned Latin. Thanks to continuous prayer of the Rosary – I can’t begin to tell how many Rosaries I said during the time of shooting – I was able to experience a special grace. I knew I wasn’t supposed to use bad language, I knew I couldn’t be rude if I wanted to say something to members of the crew. Most of them did not know about Medjugorje, they were all great actors and we were lucky to get them. But how was I to bring Medjugorje to them, if not by my own life? 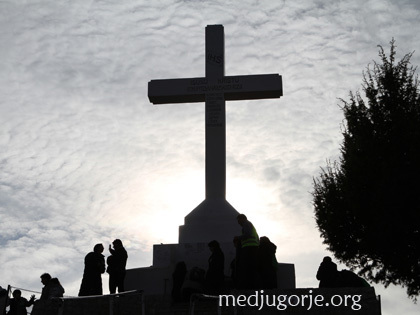 Medjugorje for me means to live the sacraments and be in unity with the Church. Thanks to Medjugorje I started to believe that Jesus was really present in the Eucharist and that he forgives my sins. Through Medjugorje I experienced how the Rosary is a powerful prayer and what a gift we have when we attend Holy Mass every day. How could I help other people to increase their faith in Jesus? I realised that this can only happen if Jesus is present in me through the Eucharist, and so people would see Jesus through my life. When we were shooting the scene of the Last Supper I had an inner pocket made in my clothes where I placed some relics of saints and a relic of Christ’s Cross. I had strong desire for Jesus to be really present and so I asked the priest to expose the Blessed Sacrament. At first, he did not want to do that, but I was persistent in asking because I was positive that people would recognise Christ more if I myself was looking at Him. The priest was standing with the Blessed Sacrament in his hands next to cameraman and together with him, he approached me. When people watch the movie and see a shimmer in my eyes, they are not aware that they really see Jesus, a reflection of the consecrated Host, in my eyes. The same was in the scene of Crucifixion: the priest was there, he held the Blessed Sacrament in his hands and I prayed all the time. The biggest challenge in the movie was not, as I originally thought, to memorise all the texts in Latin, Armenian or Hebrew, but all those physical efforts I needed to overcome. During the last scene, my shoulder was sprained and it became dislocated every time somebody hit the cross. While we filmed the scenes of the scourging, I was twice caught by those whips and I had 14cm wound on my back. My lungs were full of fluid and I had pneumonia. Chronic sleep deprivation should be added to that, since for months I had to get up at 3.00 in the morning because make-up would take almost eight hours. Another special challenge was the cold weather, temperatures hardly above zero, which was especially difficult to endure in the Crucifixion scene. My whole costume was made of one single piece of light fabric. While we were shooting the last scene, the clouds were very low and lightning struck the cross to which I was tied. Suddenly everything was silent around me and I felt my hair standing on edge. About 250 people who were around me saw my whole body being illuminated and they all saw fire on the left and on the right side of me. Many were shocked at what they saw. This posting is an excellent and a typical God-event once the Holy Spirit gets involved. Jim’s blessing offering here is monumental not only because he played Jesus in The Passion but because he is a born-again, born-anew, Jew. Thanks, Jim for your sharing and experiences! I found your experience very moving. Being a 65 year old Catholic, I would hope all would read your interview. I hope you continue to feel and pray as you did in the beginning! Your encounter made me wish for more! Thank you for your forthrightness and being so emotional and passionate about the Catholic faith and your acting career. As a priest you could not have witnessed to so many people your love for your faith; it was evident in the “Passion”. Amazing and true documentation of stories, apparitions, names of the chosen whom see the Blessed Virgin Mary. All stories, dates, times and of each apparition and very implicit message, they all match and still even though they are all are all repeated to the letter, even the date, the exact times, of each and every apparition etc. by all visionaries at their appointed times!! This is TRUE, only a foolish person would pick this Miracle apart. Like anything that is good from God and is true and again, from God Himself, even at this day when we need this intercession from the” Most Blessed Immaculate Conception”, “HERSELF!, and still Yes still.. we accept with no argument, anything, yes any little thing, even a tiny idea of doubt so easily, what does that say for all of us who believe and know the true hope Our Lady is so graciously giving us/ Will it ever be “acceptable” even after we crucified our own God…still?/// Why can’t we simply accept this Grace and Gift? But rather accept the denial of such an awesome real gift. We will never change, even these thousands of years later, how truly sad for all of us who are so happily grateful and excited each month awaiting our miracle…but again it is so sad, we have the so called ‘holy of the Hollies” deny what they themselves . with all their “knowledge” and schooling? Well, I believe it and I am a good standing Catholic, no one can convince me otherwise!!!! !